I absolutely love cinnamon. In pastries, in breads, sprinkled on apples…in scones… As a result, I have a heavy hand with the cinnamon in a lot of my recipes, often adding more than called for. This recipe I made up has plenty of cinnamon, and just enough sugar to make them sweet. The filling nearly caramelizes while baking, so although they look messy, they’re surprisingly firm when cooled. A sweet breakfast for the morning, or a dulcet little dessert, these are sure to go over well. 1. 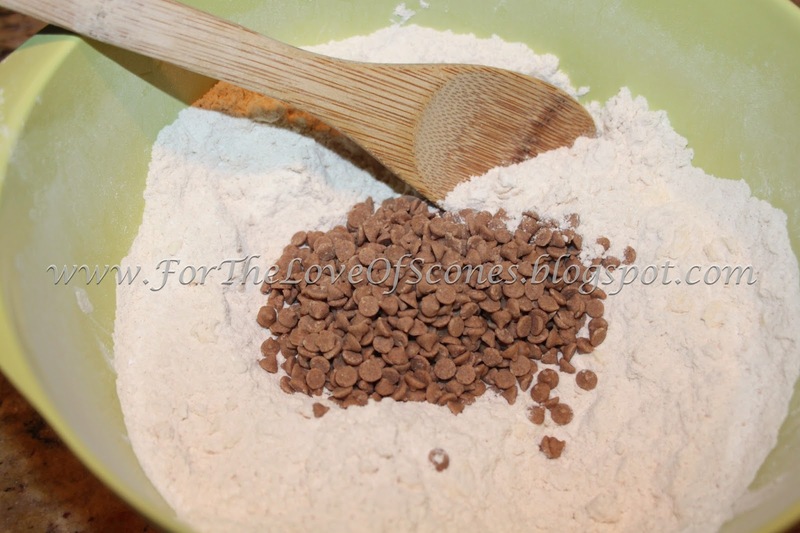 Combine baking powder, flour, sugar, salt, and cinnamon in a large bowl. 2. In a small bowl, combine cinnamon and brown sugar and set aside. 3. 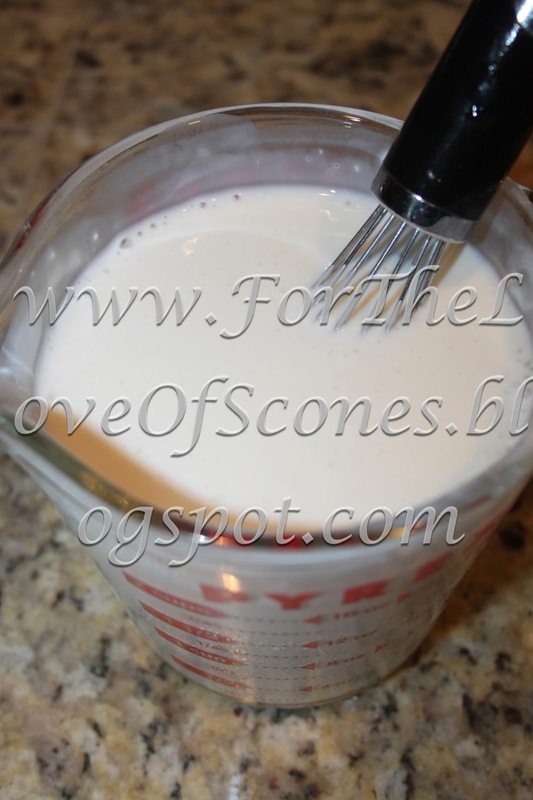 In a two-cup measuring cup or medium sized bowl, combine buttermilk and sour cream and whisk until smooth. 4. 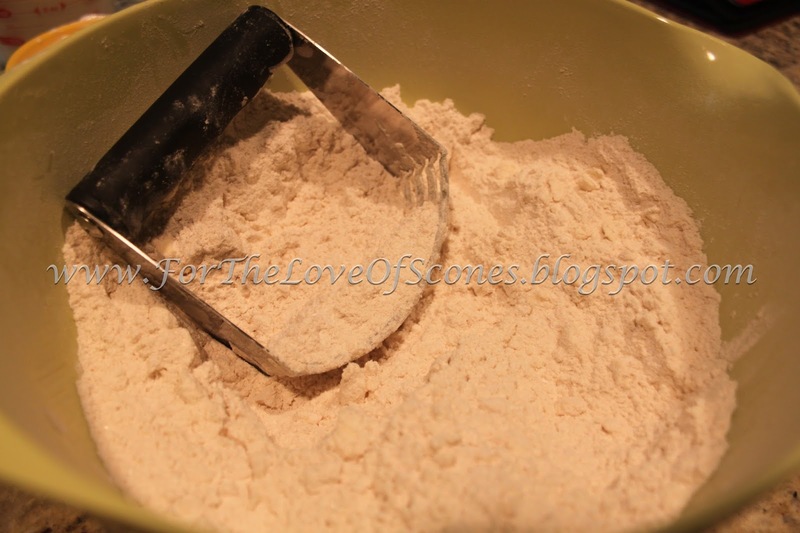 Add the cut up, cold butter to the dry ingredients and blend in with a pastry blender until it resembles coarse sand. 5. 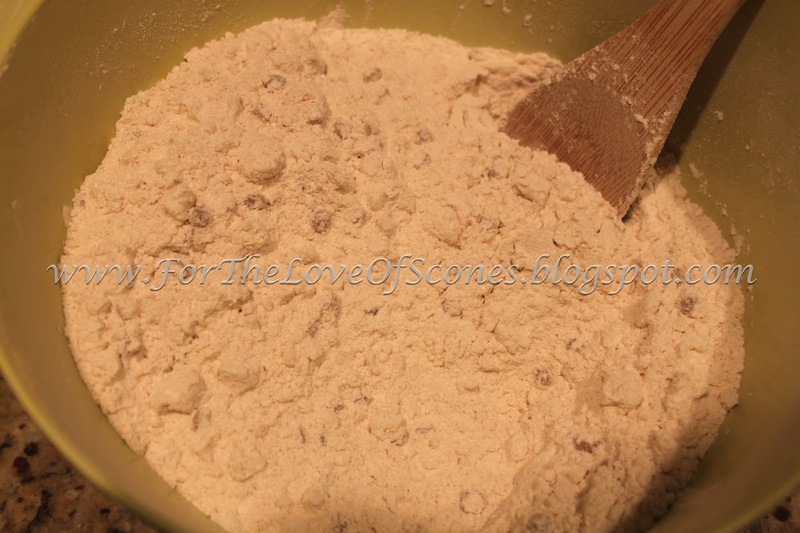 Add cinnamon chips and mix together with a wooden spoon. 7. Liberally flour your workspace and turn the dough out onto it. Flatten into a long rectangle. 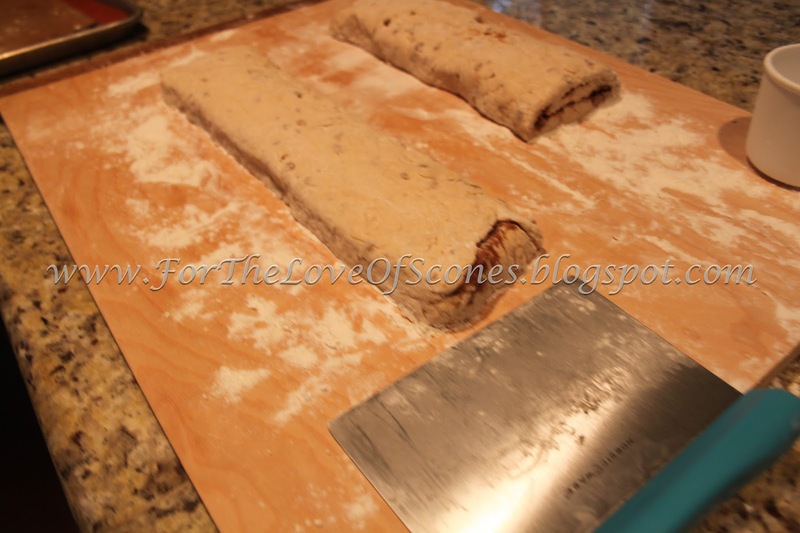 If you have a small workspace, you can cut the dough in two, and create two long rectangles of equal size. 8. 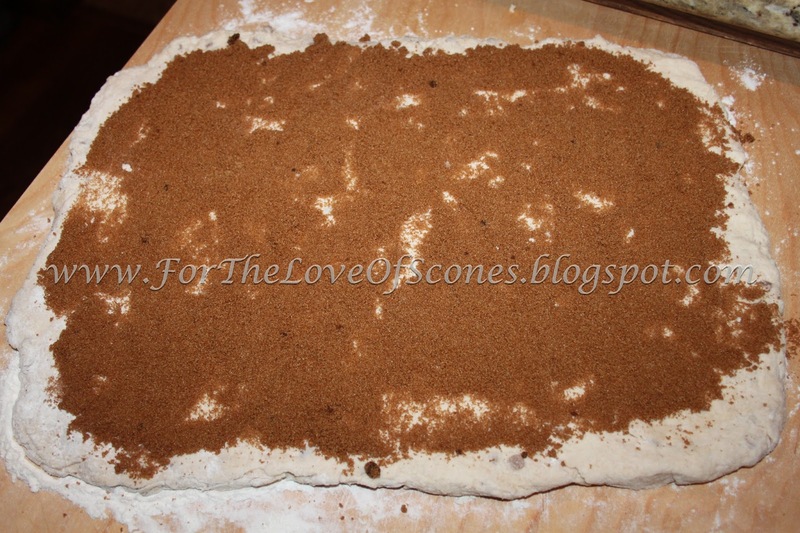 Sprinkle the brown sugar and cinnamon mixture onto the dough, leaving a half inch edge along the top so that the dough can seal when you fold it. Sprinkle a handful of cinnamon chips over the brown sugar mixture, pressing them gently into the dough so that they don’t fall when you fold it. 9. Fold two times, lengthwise (envelope style) and use your hands to make it even. 10. 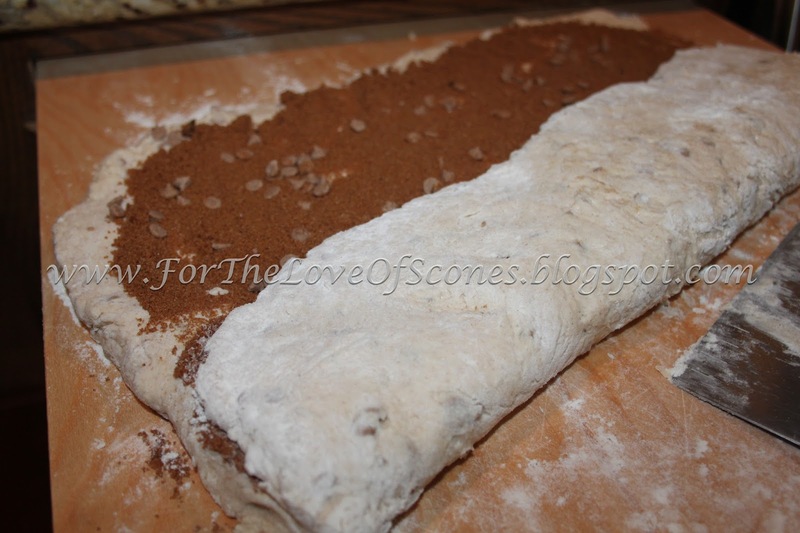 Using a dough scraper, lift the dough onto a parchment-lined baking sheet and place entire sheet in freezer for 15 minutes or until the dough has firmed slightly. Preheat the oven to 450ºF during this time. 11. Remove from freezer and return to a well-floured workspace. You should be able to move the dough easier now that it’s hardened. 12. 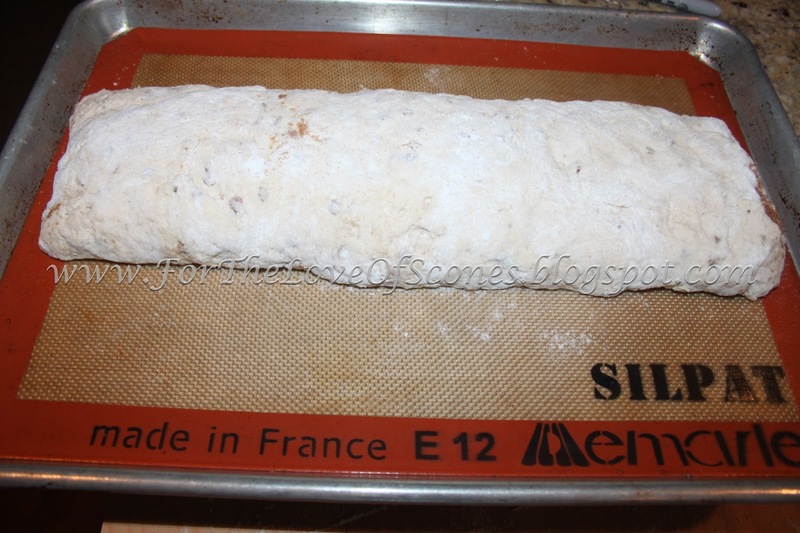 Stretch the dough out along the workspace until it is about 1 to 1-1/4 inches high and about 3-4 inches wide. 13. 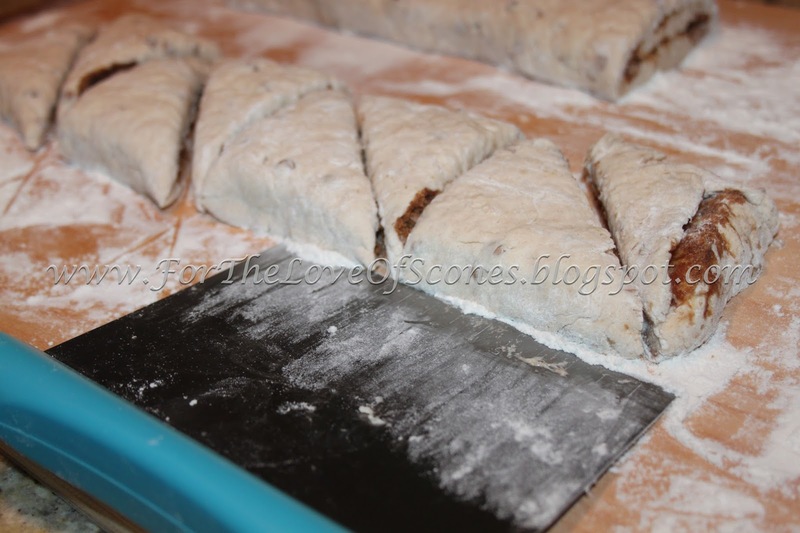 With a sharp knife or your bench scraper, cut the dough into even rectangles, then cut those rectangles into triangles. It is easiest to first cut the dough in half, then half each half, etc. until you reach the size scone you desire. Makes 16-20 scones. *These scones bake best if frozen or still chilled before going in oven, as the filling will be less likely to seep out. If they are warming up at this point, return to the freezer for 10 minutes. 14. Transfer scones to a parchment-lined baking sheet and brush with heavy whipping cream. 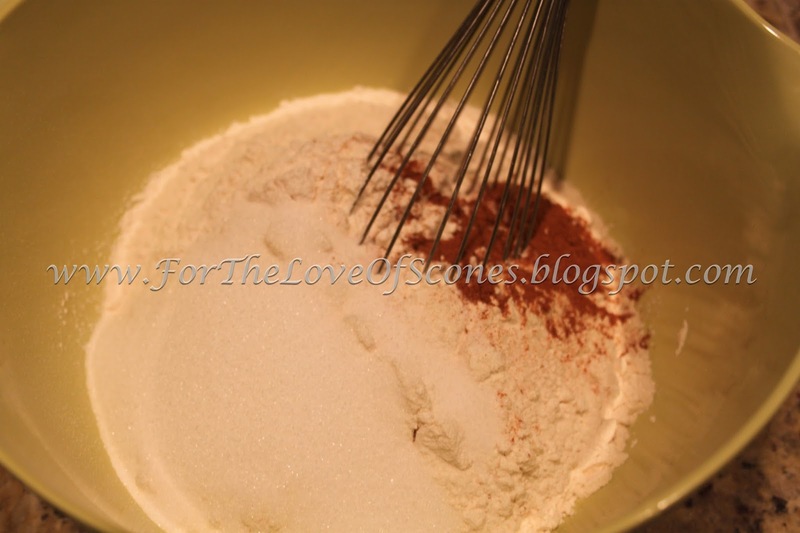 Sprinkle with cinnamon sugar topping. 15. Bake* at 450ºF until golden brown on top, 15-20 mins. Cool at least 5 minutes and serve warm or cooled. 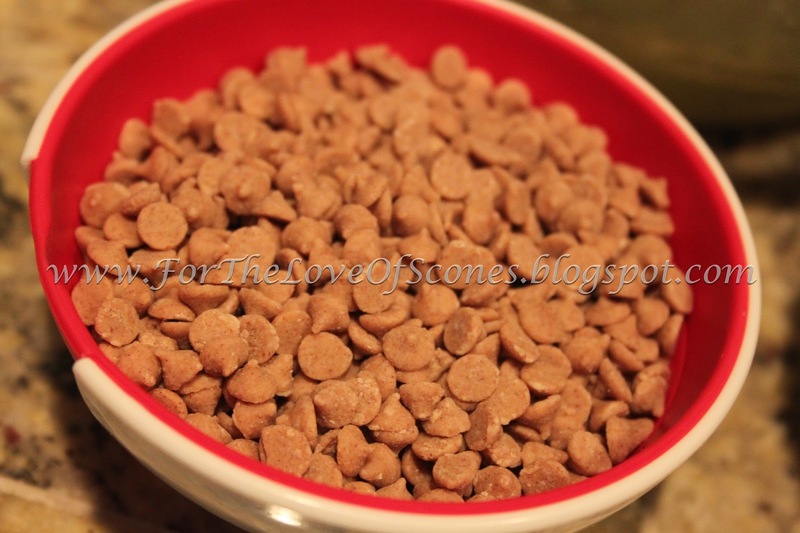 Cinnamon Chips are similar to chocolate chips. I got mine at Amazon.com from The Prepared Pantry. 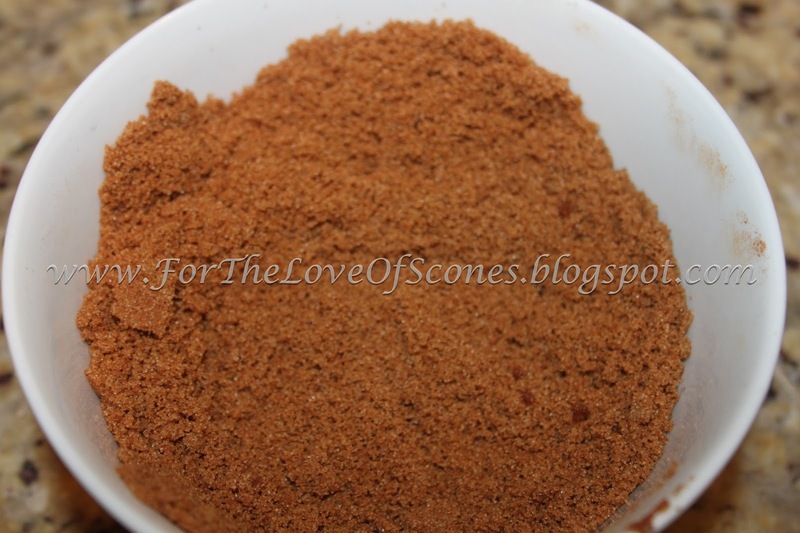 Sprinkle the 2 tsp of cinnamon onto the brown sugar for the filling. Use a whisk to combine. Combine the sour cream and buttermilk. 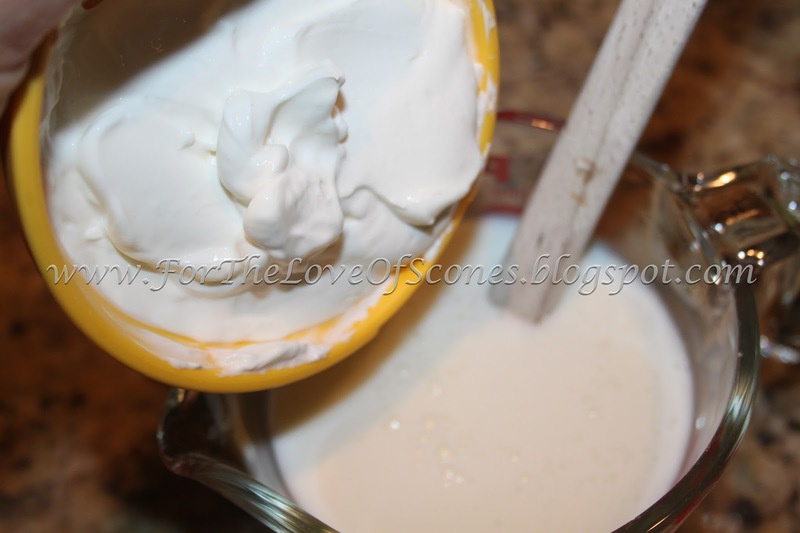 Use a whisk to make sure there are no lumps of sour cream left in the mixture. 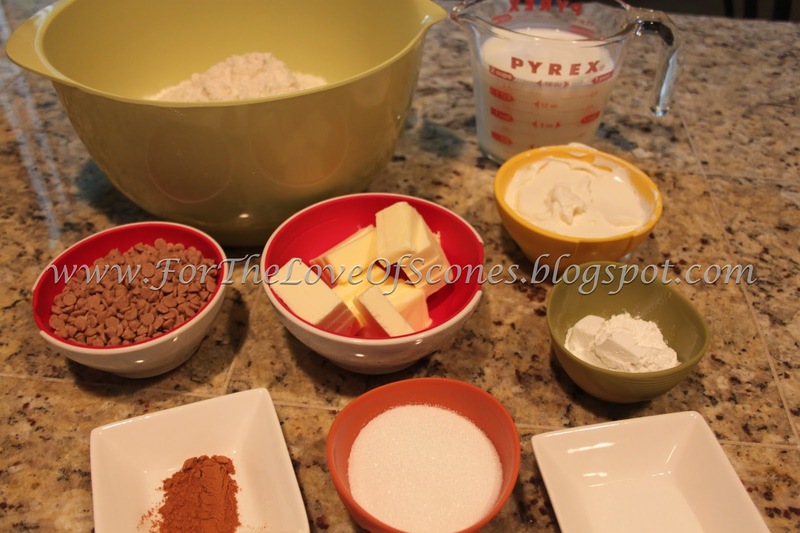 Combine baking powder, flour, salt, sugar, and cinnamon. Whisk to combine. 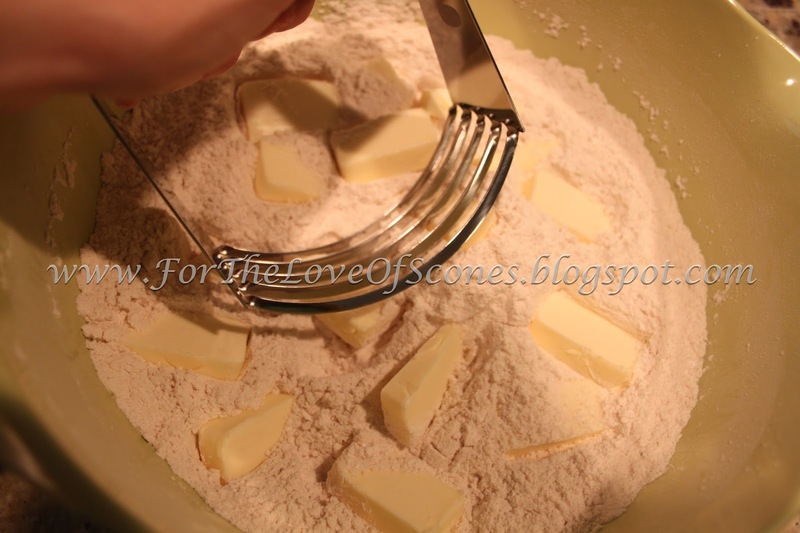 Add the chopped butter and use a pastry blender to combine. A few small lumps of butter are okay. 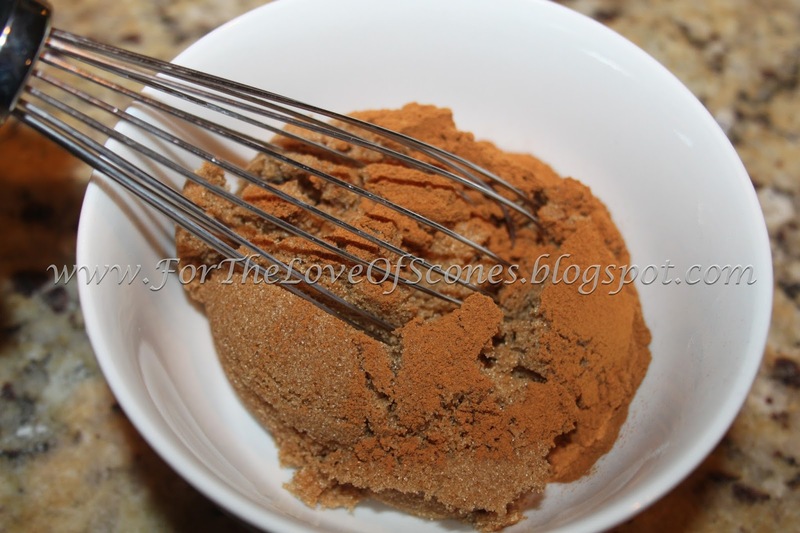 The mixture should resemble coarse sand. …mix with a wooden spoon. 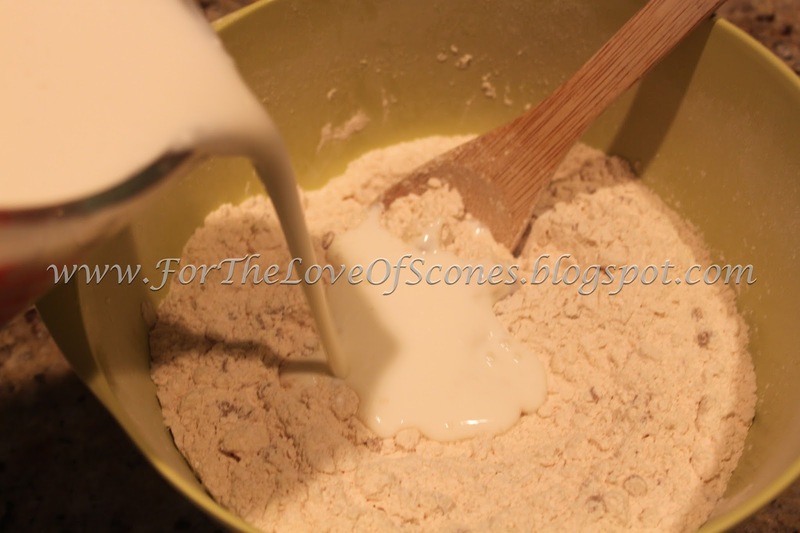 Add the buttermilk/sour cream mixture and use a wooden spoon to mix. 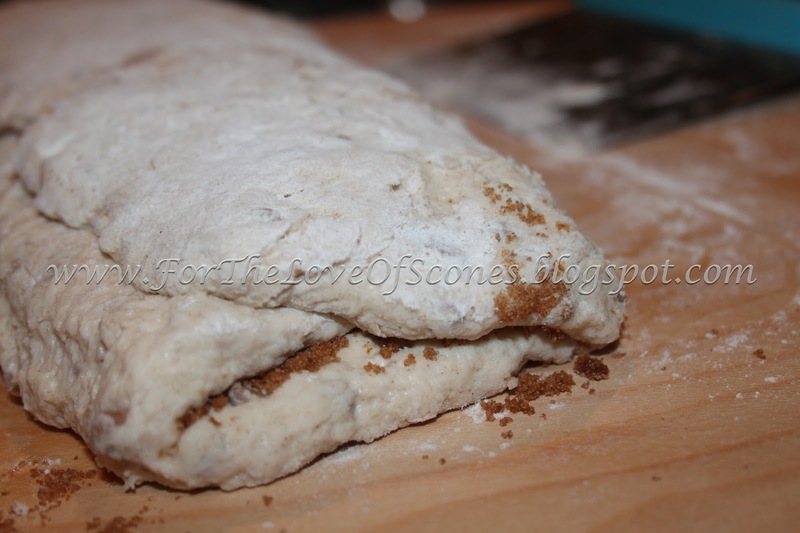 The mixed dough should be soft and slightly tacky, not wet. 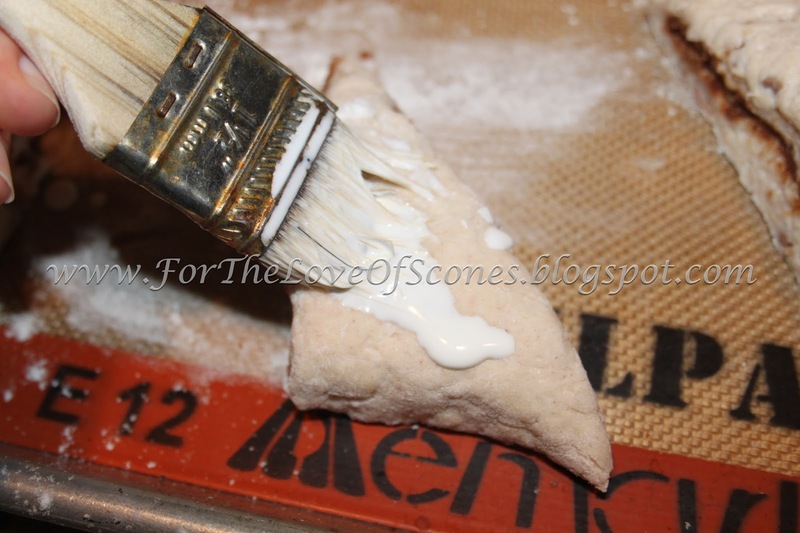 Flatten out the dough on a generously floured workspace to prevent sticking. 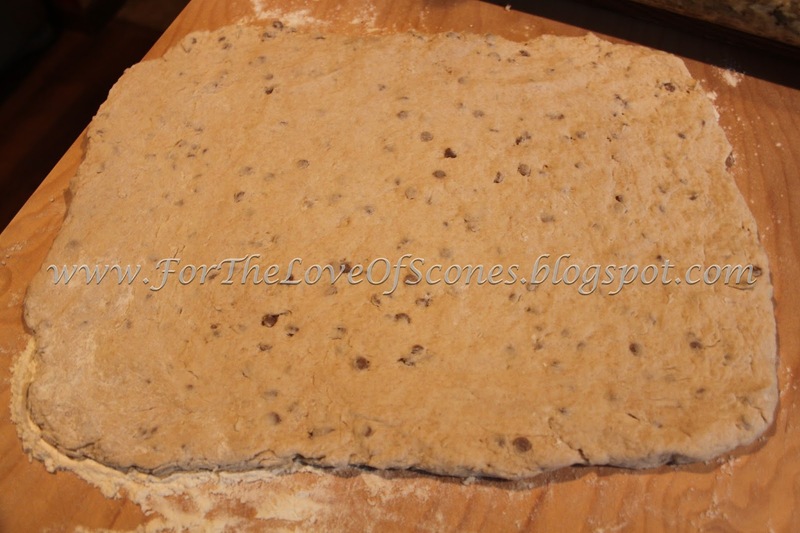 Flatten dough to about 3/4-inch thick (you will flatten it more later). 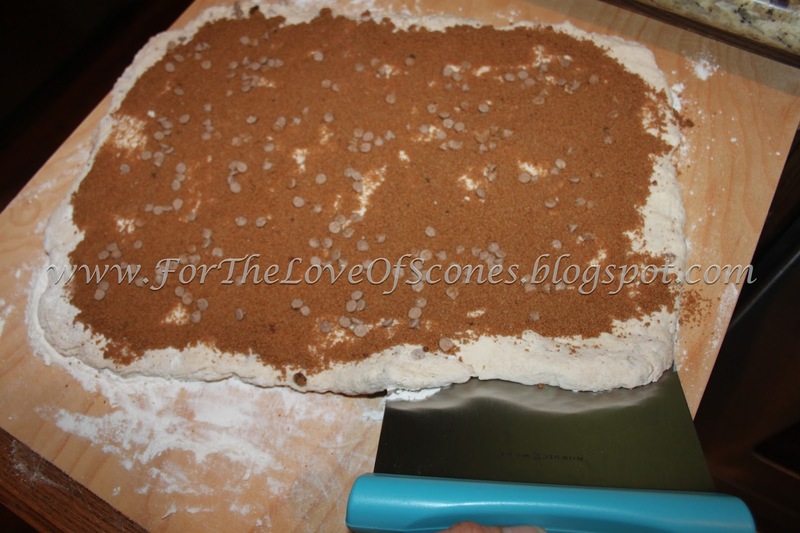 Spread the cinnamon/brown sugar mix over the dough, leaving a little bit of room at least at the wide top (here the top or bottom) to allow the dough to seal when you fold it. Sprinkle the handful of reserved cinnamon chips over the top of the cinnamon/brown sugar and press gently into dough to prevent their falling out when you fold the dough. 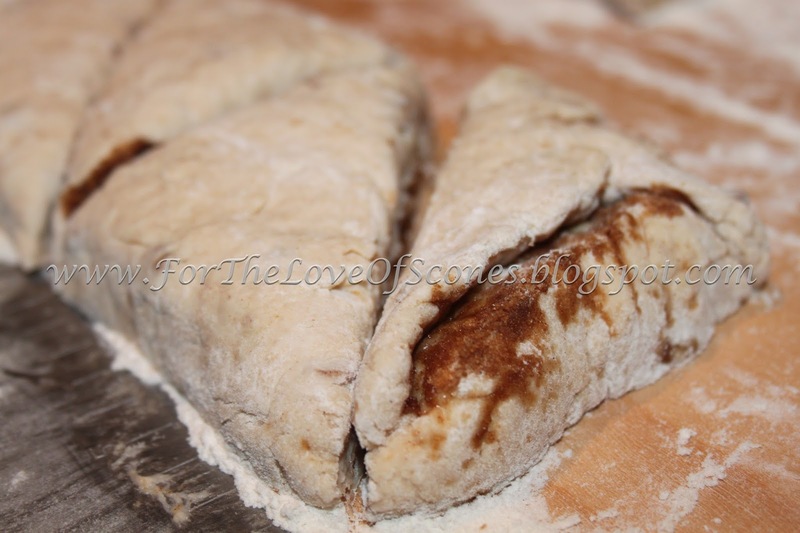 Fold the dough in thirds by folding it twice, folding it like an envelope. 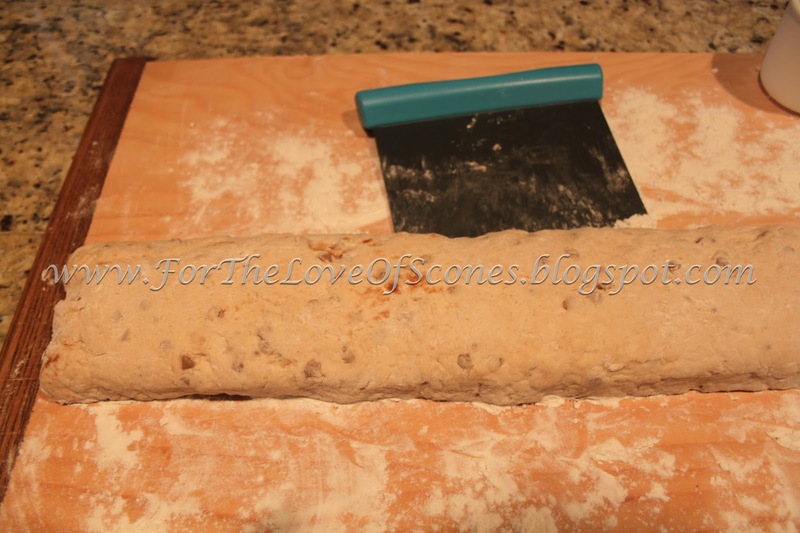 A bench scraper helps tremendously to prevent the dough from sticking to the counter and for added support. 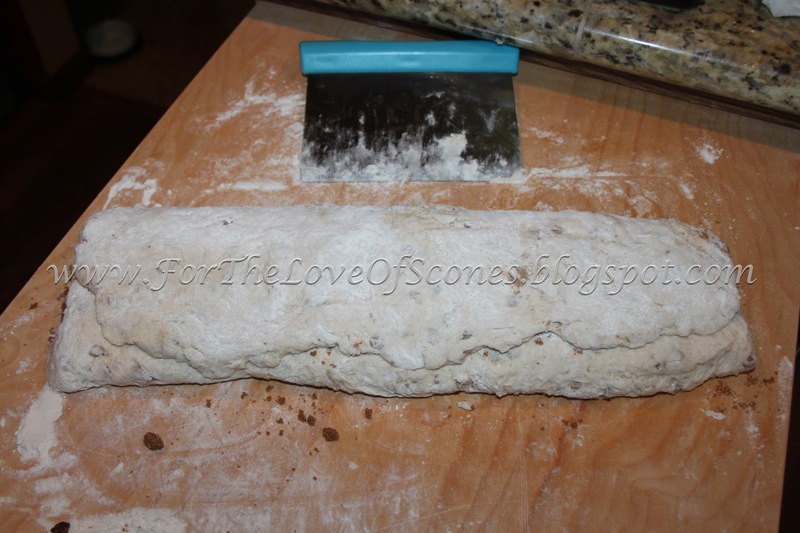 Fold the top down and press the edges down to seal the dough (the ends are okay to leave unsealed). My end didn’t look too pretty, but it’s okay. Again, here the bench scraper helps to add support for transferring this soft dough to the parchment-lined baking sheet. After the dough has hardened in the freezer for about 15 minutes (or until it’s noticeably stiffer), return to your generously floured workspace. 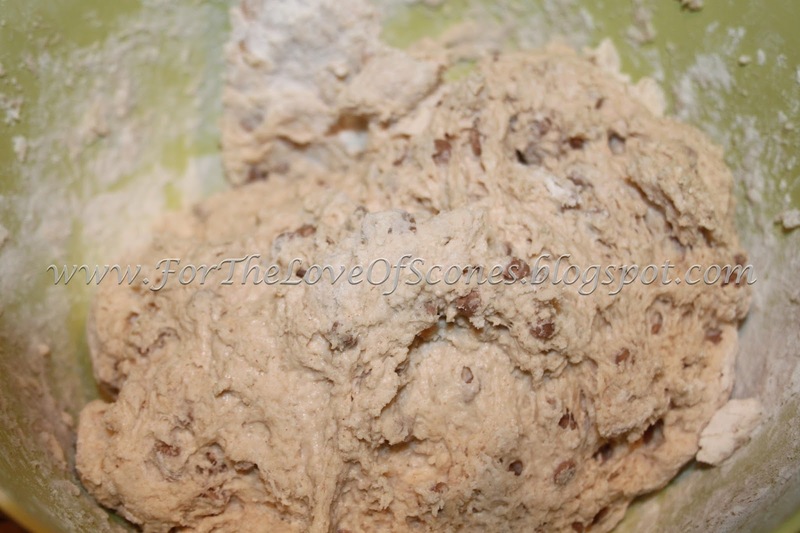 Stretch the dough out using your hands until the dough is about 1-1/4-inch high and maybe 3 or 4 inches wide. To make this easier, I cut the log of dough in half. After you stretch out the chilled log to the desired width and length, use a bench scraper or sharp knife to cut into triangles. 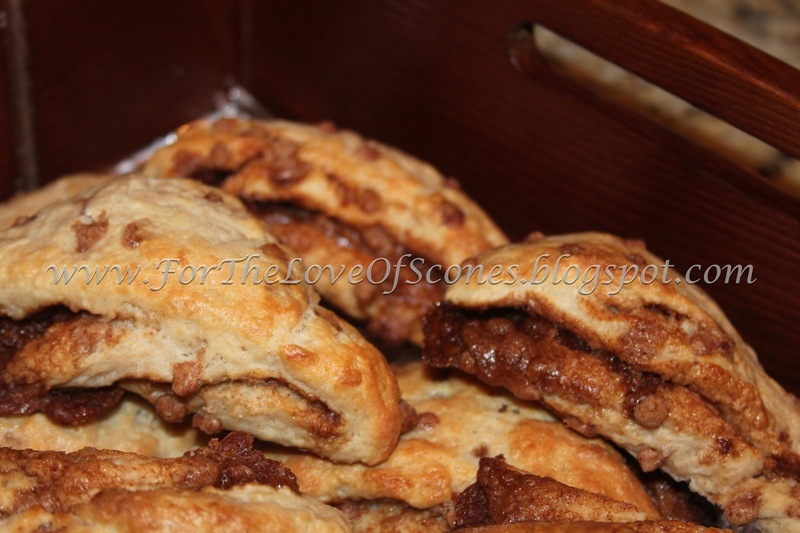 I like to keep my scones on the small side, and this recipe yielded 20 scones. Place the scones on a parchment-lined baking sheet and brush with heavy whipping cream. Then sprinkle with the cinnamon sugar (not shown in this version) and bake at 450F for about 15-20 minutes. These scones bake best if chilled or frozen completely (this prevents the filling from seeping as much). The finished product. This does not show the cinnamon-sugar topping, as I added that in a second attempt. This batch was only slightly chilled, and so more of the filling seeped. Both batches I made of this recipe, one without the cinnamon-sugar topping and one with, were extremely well received. 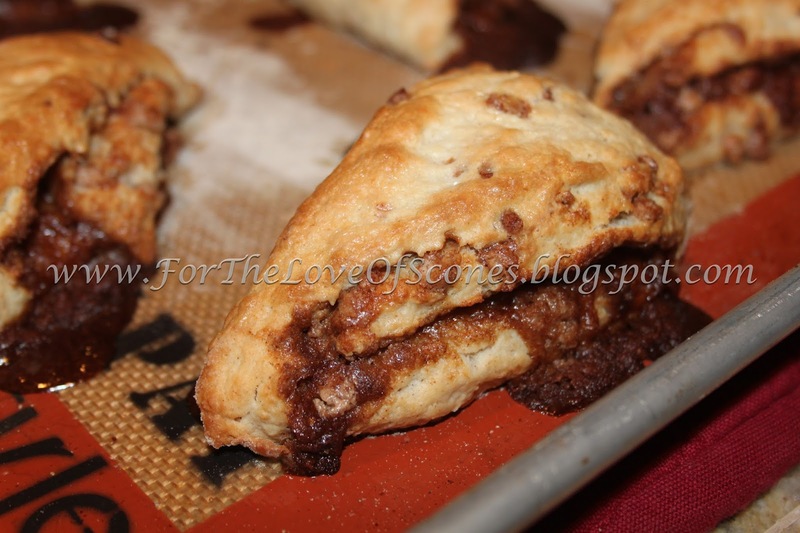 Rarely have my scones gone so quickly as this recipe did. Personally, I felt like the original scones, sans cinnamon-sugar topping, were a touch bland, thus I added the topping to make a triple cinnamon scone. I think this was a good choice, but the topping is ultimately optional. Freezing the dough really helps keep these scones together. If they get too warm when you’re working with the dough, put back in the freezer until they firm up.